LOGAN SQUARE — Logan Arcade is often packed with vintage arcade lovers on any of its 80-plus stand-alone games, but one game in particular stands out from the crowd. It’s called Killer Queen, and it’s the clear draw for many players looking for cooperative yet intensely competitive gameplay. The arcade was the first in the nation to have a Killer Queen console. 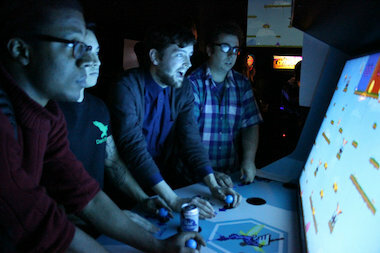 The game remains relatively unknown — there are only four consoles worldwide — but word is spreading, according to Killer Queen regulars in Logan Square. That’s led to a unique atmosphere around the multiplayer video console in Chicago. There is a glossary of terms created organically through continual play and tournament-style competitions (which include one in Portland that is known as a “Chicago-style throwdown”). The relatively rare, 10-player arcade game Killer Queen can be found at Logan Hardware. For those uninitiated in the world of arcade games, Killer Queen can be seen as a combination of Super Mario and Joust — with “a little bit of s--- talking” thrown in for good measure, according to Jim Zespy, owner of Logan Arcade and an avid historian and collector of vintage arcade games. 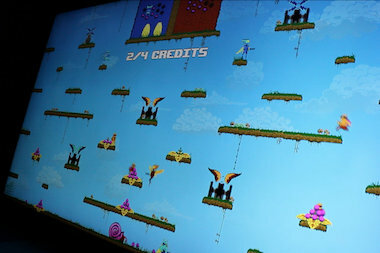 The Killer Queen game is actually two conjoined consoles where two teams of five play on opposite sides, each team facing a large screen in the middle. There are three ways to win Killer Queen, and all three result in raucous applause for a well-orchestrated victory. To win, a team must work together to either kill the queen (a “military win”), place a set of 12 berries on the screen’s center-top platform (an “economic win”) or ride a snail across the bottom of the screen toward victory (simply, a “snail win”). Like any well-developed game, Killer Queen is easy to learn and difficult to master, Zespy said. Chicago being the first city to have a Killer Queen console is a matter of “hometown pride,” but what he enjoys most about the game is the social aspect. Since the game was brought to town in July, Zespy has seen friendships form and groups grow tighter as newcomers and arcade veterans come together around the console. 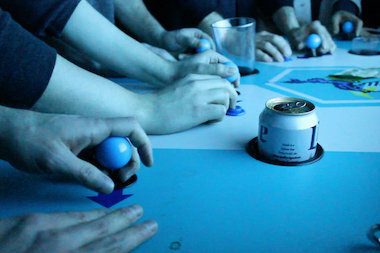 The classic image of a lone arcade player hunched over and lit up in the dark still applies here, but Killer Queen, originally developed as a physical field game, aims to bring those solitary players together. Unlike the vast majority of arcade games, Killer Queen requires social interaction, cooperation and a welcoming atmosphere. “Lives” continue throughout the game no matter how many times a player dies, so new players are continually encouraged to jump in and join a team without fear of ruining a winning streak. But it doesn’t end there. Chicago players of the game have created their own songs and chants, both linked to facets of the game — serving both as rallying cries and warnings. And because of the limited number of Killer Queen consoles available worldwide, regional differences have formed among the four sets — ranging from preferred types of wins (Chicago prefers the “economic win”) to relatively “shameful wins” (a snail win being the most shameful of all, according to Killer Queen player Zaid Alawi). Tournaments are held regularly in Chicago, and a live projection of the Killer Queen screen is set up on a wall so onlookers can keep track of strategy and wins. And it’s serious gameplay; between the lively chants and cheers, an official Logan Arcade announcer often performs live color commentary — like a major league sports announcer. Between tournaments, players come in regularly to practice. “It’s really refreshing to play a cooperative game … I’ve made good friends,” said Lauren Kaufman, a 25-year-old Chicago Public Schools teacher and Logan Square resident who said she stops by Logan Arcade to brush up on her Killer Queen chops for a couple hours every day. Kaufman is a typical Killer Queen fan in that way. Of the roughly 20 players gathered around the console Wednesday night, most said they stop in regularly every week to play or watch other players. And that’s the kind of atmosphere Zespy hopes to foster, he said. One example: A woman from Hyde Park who just moved to Chicago has consistently traveled to Logan Square to meet new people while playing Killer Queen, he said. In fact, you can play at 1 p.m. Jan. 25 during the Killer Queen “Founders Tournament,” where the game’s developers will travel to Logan Arcade to watch the competition in person. The entrance fee is $25 per team, but you play to win, and the winning team of "the world's only 10-person arcade strategy game" wins cash. The tournament will be followed by a Q&A session with the game's developers.